In addition to the high altar of the sanctuary the plan provides for the customary side altars of the Virgin Mary and Saint Joseph in prominent positions in a manner that is an integral part of the design. The plan also provides for shrines in the transepts and along the nave. On the 83rd Street side of the church is found the Chapel of the Virgin. The Cararra marble figure of the Mother and Child predates the construction of the present church, having been transferred to its location from the “old church”, the school. The statue depicts the Holy Mother tenderly cradling her Divine Child, while at the same time presenting Him to us. She wears a crown signifying her position as Queen of Heaven and treads upon a serpent declaring Mary to be the “new” Eve, who by her obedience to the will of God rectifies the original sin of our ancestral mother. The crescent moon under her feet and the gilded aureole and star motif carved on the rear wall identify her as the women clothed with the sun, the moon under her feet, from Revelation 12:1, and proclaim the unique role Mary holds in salvation history. The chapel altar is of Rosso Levanto and Botticino marble, the wall is of Verdi Issoire. Mary’s chief feasts are her Immaculate Conception, December 8th and her Assumption, August 15th. Between the Virgin’s shrine and the transept door is the small niche shrine of the Infant Jesus of Prague. Devotion to Our Lord under this title goes back to the late Middle Ages in central Europe. Christ, depicted as a child is dressed in royal robes of scarlet and ermine and crowned as a king. He holds in his hand an orb, symbol of rule, while bestowing a blessing in the traditional hand gesture, two fingers joined to symbolize His two natures, human and divine, three fingers joined for the Three Persons of the Trinity. In a prominent niche between the two confessionals of the south transept is the shrine of the Sacred Heart. Devotion to Our Lord under this title can be traced back to the Middle Ages, but did not gain a popular following until the visions of St. Margaret Mary (1673-1675). Our Lord displays his Sacred Heart and wounded side, recalling the promise that living water would flow from his heart, John 7:37. The Feast of the Sacred Heart is observed on the Friday following the second Sunday after Pentecost. In the shrine to our parish’s patron the damaged window depicts the enclosed garden, a symbol of the Virgin and her Immaculate Conception. The window’s imagery, drawn from the Song of Solomon, 4:12, has long been considered by Christian theologians to refer to Mary. The statue of Saint Anselm holds a ship to proclaim the many voyages and exiles he endured in defense of church teaching. The marble work of this chapel is particularly fine, in its color, veining, and mounting on the walls. 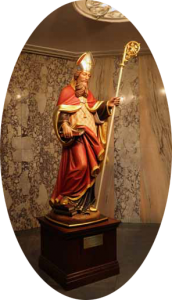 Saint Anselm’s feast is celebrated on April 21st. Pairing with the Chapel of the Virgin, across the sanctuary, and in a similar position of prominence, is the Altar of Saint Joseph, foster father of Our Lord. The statue, like that of the Virgin, comes from the “old” church and thus predates the present building. Carved of Cararra marble, the saint’s image is traditional in conception. He holds a spray of lilies in his right hand to symbolize purity, while in his left hand he carries a t-square emblematic of his occupation as a carpenter. As is customary, Joseph is depicted as more advanced in years than Mary. The altar is constructed of Bianco, Venato Zerbino and Rosso Levanto marble; and is largely obscured by the votive candles. The rear wall of the chapel is carved and gilded with a design of lilies and stars. The feast days of Saint Joseph are March 19th and May 1st. To the right of Saint Joseph’s Chapel is a small niche occupied by a statue of the beloved Saint Anthony. Born of a noble family in Lisbon, Portugal, in 1195, Anthony studied at the Cathedral School of that city and was received into the Augustinian Order in 1210. Inspired by the transfer of relics of Franciscans martyred in Morocco he entered the Franciscan Order in 1221. While attending the General Chapter of the order in 1221 he was called upon to preach and inspired everyone with his eloquence. Saint Francis appointed him chief lector in theology for the order. Anthony traveled and taught throughout southern France and northern Italy. Spending the last few years of his life in Padua, he died there in 1231. Saint Anthony’s feast is observed on June 13th. The large niche between the north transept confessionals contains the shrine of Saint Ann and the Child Mary. While nothing is known of the parents of the Blessed Virgin from the Bible, the non-scriptural Book of James, dating from the 2nd century, contains information on Mary’s parents Saints Ann and Joachim. Like the Old Testament Hannah in the first Book of Samuel tradition says that Ann and Joachim were unable to have a child until in prayer they offered any child they might have to the service of the Lord. Mary, of course is the fruit of that prayerful commitment. Ann is depicted teaching Mary to read and pray. Saint Ann is the patroness of Brittany, a region in northwest France and of Quebec, Canada. There she is honored by the grand shrine on the banks of the Saint Lawrence River – Saint Anne de Beaupre (Good Prayer) recalling the efficacy of her prayer to the Lord. July 26th is the Feast of Saint Ann. Immediately next to the north transept is the Chapel of the Saints, which until recently was the site of the baptistry. Much of the design and decoration recalls this original purpose. Fish cavort over the glass of the ceiling fixture, while the Holy Spirit descends in the form of a dove. The tracery of the two windows and the color of the glass remind the visitor of the waters of baptism. The circular ceiling and walls divided by four niches into an octagon recall the great baptistries of late Roman times and Italy in the early Middle Ages. The green marble flooring symbolizes new life. The font was removed several years ago to its position of importance in the nave, permitting the celebration of the sacrament to take place in the midst of the assembly and allowing for the rededication of this space to four much loved saints. Though an Apostle of Our Lord, little is known from scripture of his life and ministry after the Ascension. He is mentioned in Luke 6:16, Acts 1:13 and John 14:22. By tradition he and his companion Saint Simon preached the gospel in Persia, where they were martyred. The saint is shown wearing a medallion of Our Lord and surmounted by a tongue of flame to symbolize his presence at the descent of the Holy Spirit on Pentecost. Saint Jude’s feast day is the 19th of June. The son of a wealthy merchant, Francis renounced his family’s money to embrace a life of poverty and preaching, starting the Franciscan order. He is frequently depicted with a bird, as a symbol of his preaching. Francis was the first saint to receive the Stigmata, the visible wounds of Our Lord, in 1224, a commemoration celebrated on September 17th. Dying in 1226, he was declared a saint two years later. The Feast of Saint Francis is celebrated on October 4th. Saint Therese entered the Carmelite convent of Lisieux at the age of 15 and was professed in the order at 17. Her wish to join nuns of the order in missionary work in China was prevented by poor health. She is universally known for her autobiography, “The Story of a Soul”. Dying from tuberculosis in 1897, she promised to send down from heaven a shower of graces, symbolized by roses. Patroness of Foreign Missions and, with Joan of Arc, of France her feast is October 3rd. Born in the town of Pietrelcina in 1887, Saint Pio, popularly known throughout his life as Padre Pio, was christened Francesco. Received into the Capuchin order in 1903, he took the name Fra Pio. In 1911 he confessed to his spiritual advisor that he had been experiencing the pains of an invisible Stigmata in his hands and feet. In 1918 the Stigmata became visible. Saint Pio is depicted in a Franciscan habit, wearing cut off gloves to cover the wounds on his hands. September 23rd is observed as his feast day.